PRODUCTION EXPO 2014: With no less than six UK and US Number 1s under his belt, not to mention a Grammy for his co-writing and production work with Adele on Set Fire to the Rain, Fraser T Smith has an impeccable collaboration list, which includes Tynchy Stryder, Plan B, CeeLo Green, Taio Cruz, Kaiser Chiefs as well as the aforementioned Adele. 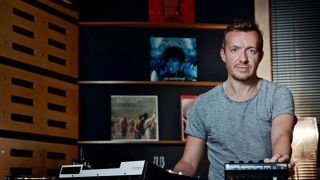 Smith epitomises the multi-tasking modern, hands-on producer so who better to ask about co-writing, producing hit songs and well, pimping-out your MPC! Do you have any steadfast production rules? "The boundaries of songwriting and production are very blurred"
"I think the song is always key. I think to be able to break something down into a very simple format - acoustic guitar, piano - is really important. I've started a lot of songs that way. Even Break Your Heart that I did with Taio Cruz started out on an acoustic guitar. It's not only piano ballads that start life on a piano. I think it just brings out some kind of communication between yourself and the singer. "So I think the song is definitely key to a lot of productions. I don't think that there's a lot of point in producing something that's not a great song. We've all done it and tried to change up an average song with a brilliant production. I think you can make an average song into something that's good but I'm not sure you can make an average song into something amazing." You're usually involved in the writing process when you work with artists. Is that part of the role when you produce? "That, to me is the ultimate thing because the boundaries of songwriting and production are very blurred. You can be writing a song, then do a bit of a beat, write some more, maybe come up with a strings line. Everything, for me, is intertwined it can be frustrating when you're only producing but you want to get in on the writing side or the song structure. "I do feel that the productions that have always really worked have been where I've been involved in the song as well. Ultimately, everything should be supporting the message, lyric and melody of the song." Are there any production techniques you'd care to share? "MPC is always king with me. I usually start with some ideas and concepts so, for me, getting a vibe on the song is really important. To be able to work quickly I usually use a Juno 106 and my MPC4000 just to get something that excites me at the beginning. It usually starts on the drums as I like big drums. Then it's really about broad strokes and quick, vibey, out-of-the-box brushstrokes. "Once I then take that vibed idea into the box then I'll refine it a lot more; looking at the dynamics, maybe refining some of the percussive elements and also looking at how the structures link from section to section. How the production feels emotionally and how the production supports the song." How precious are you with your initial arrangements? "I can be quite black and white. I think there's a tendency when you can open up a million soft-synths and plug-ins to over-complicate it. What's great for me is that when I have drums, say from the MPC, hardware synths or guitars I think those sounds have so much more room around them, if that makes sense. So, its good that I don't really feel like I ever need more sounds than maybe I should put in. "I did a song called, Future with Bi-Polar Sunshine, which has just come out and literally there are three elements…drums, which are a kick, snare and some percussion, some bass and there's a piano that comes in. The sounds at source were quite big and there's a lot of harmonic information within them. It felt like we didn't want to put anything else on. "If I start from a soft-synth place then I usually end up putting more soft-synths in so I'm careful at the beginning of a track to make sure that the sources are good. If I can record a real piano or a piano sample at the beginning then that's good just because you're focusing a lot on the main elements. "People can't really focus on more than 3 things at once anyway, which is bass, drums vocals and maybe whatever you've got in the mid-range should obviously support that. I'm always trying to do that Rick Rubin thing of being a reducer and not a producer." Does that ever put you at odds with the bands/artists? "I think people like minimal. There's always that tendency when you look around the studio and see a bit of gear or you look at the soft-synths to think you could a little bit of this or that but actually I think if you can get away with less then everything has more space. "Someone like Pharrell is the master of that: of really not being afraid to have a lot of space. It's about making sure that the groove is there and then whatever else is in there has got to be making some kind of statement, really." What's currently your go-to gear in your studio set-up? "I've actually got two, pimped-out, blacked-out MPC4000s. I was doing a track with Kano yesterday, who I've worked with for years, and I was on one MPC doing the hi-hats and he was on the other doing the kick and snare. It was just a great moment. "Apart from the MPCs I'm using the Moog Minitaur a lot, which I just think is the best bass I've ever heard! It's synced up with the MPC so you're getting the MPC clock and it just feels tight when you're coming up with an 8bar loop. The Juno 106 and Roland Integra are definitely always in there and a Technics 1210 recording into the Akai. "I've also been using my Roland SH101 a lot recently as it's unpredictable for wobbly bass and effects. Those are all to get stuff in, then when I'm in the box I use a lot of the Native Instruments and Arturia stuff as well as samples within ProTools 11. I'm looking around the studio and I've got basses, guitars and live drums, which I'll often track." "I think a lot of people waste time choosing hi-hats when they should've been working on the chorus"
The MPCs are a very beat-focused bit of kit, aren't they? "[Laughs] I just love drums. I think I'm a frustrated drummer! I love the concept of NI's Maschine or the Arturia drum things but there's just something about the Akai that I just cannot seem to replicate in the box. It's the way that it makes the drums sound. "I don't know what Roger Linn was doing but he did something right. It's not sample accurate so it's quite random which adds to the charm especially when you track a few things into it. How do you choose what kit you want for your set-up? "I'm quite obsessive about reading articles on things. I recently got a new Sennheiser SD 509 vintage mic for guitars through reading a review that said a couple of people I really respect are using them. I bought the Beyerdynamic M160 ribbon mic as it was the type Eddie Kramer used on Jimi Hendrix's guitar. "I went into another studio a few years back and tried out the Tube-Tech CL 1B compressor on a vocal and that's now my main vocal compressor. Also, my good friend Eric Valentine in Los Angeles makes the UTA Undertone Audio stuff and I hooked up with him as I was a fan of his production. He designed me a desk, which is a 32-channel valve desk and his EQ is absolutely incredible. It's got all the punch and snap of an SSL but with the warmth of an old Neve or EMI desk. "I'm enjoying being on ProTools 11. It's an amazing platform. A lot of producers seem to work on Logic but I think there's a switchover to ProTools now it's 64bit as the architecture now lets you run so many more plug-ins and soft-synths. Basically my whole studio is powered off a laptop, which is quite crazy to me. I've got all this gear and the actual engine-room for the sound is a MacBook Pro." Given your knack of having number one singles, can you tell us the secret? "Again it comes back to having a great song. I think, a fantastic vocal. When we talk about vocal production that's a big part of it - making sure that when you record the vocal it sounds as good and as emotive as it can be. A good mix is really important but also that the song gets to breathe and hits the spot in the right places. "The key to production is perspective and I think a lot of people waste time choosing hi-hats when they maybe should've been looking for the title of the song or working on the chorus. Perspective is also about sitting at the back of the room while it plays or maybe go out of the room and listen to it while you've making a cup of coffee and feel what it sounds like from afar. That's a really good test."